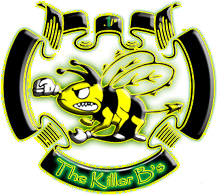 The story of The Killer B's starts on May 1st, 2004. Manager TommieW has just received his Hattrick Team and tips his brother, larsw84, about Hattrick. He signs up and requests a team named The Killer B's. This name was only a logical choice, since larsw84 has always used KillerB as a nickname for himself in games. 'Nickname' of course is not to be confused with 'login name' here. After an almost two month wait larsw84 finally receives his team on June 22nd, 2004 and the B's are born. Fortunate enough, the team handed to larsw84 is a team in the at that time brand new Dutch IXth division. The team was taken over just half a week for the league started. That gave larsw84 enough time to arrange a first friendly ánd buy some better players, among which current coach Priidu Joon and the inner midfielder who would turn out to be the league topscorer with no less than 18 goals: Massimo Laterza. The B's immediately start of training Playmaking. A new coach is hired: Frederic Robin, a passable coach with poor leadership. The B's first trainees are Benny Turjeman, Eimantas Naktinis and Hattori Carstens. They would be sold later on at various stages of training. Turjeman remains at the B's the longest and is finally sold at Outstanding Playmaking. The B's turned out to be the best team by far in their first league, the IX.314. All 14 games are won, the B's score the most goals and have to concede least (only 6!). They finish 12 points ahead of the number two, real foppie united. The new season starts with the B's first appearance in the KNVB Beker. Against the at that time in VI playing HGC the B's unfortunately lose only 3 to 4 in a match that could've gone either way. A new deception follows in the first match of the new league, VIII.401, as well as the B's lose their first points in a league game against G_Saray: 1-1. The B's pick up their old winning routine after the first match, but in the 6th match of the season the B's lose for the first time in a league game. Demon Devils proves way too strong: the B's are wiped off the field with no less than 1-5 (at home!). Although... wiped of the field... closer inspection tells us this was not only the B's first loss (and by the way up to this day their biggest loss in a league match! ), it was also the B's first encounter with the Match engine in a Bad Mood. In other words: the B's were screwed hopelessly. If you don't believe me: here's the matchid: 28561498. On December 7th, 2004 another big player is bought. Valeriy Derepa joins the B's and starts of training immediately. Valeriy would immediately become the favourite player of manager larsw84 and currently, almost 4,5 RL years later, still is playing for the B's. He's an excellent coach now and still a very valuable player, at titanic PM, formidable passing and passable defending. Shortly before the second match against Demon Devils the B's board decides to use some extreme measures not to let a horrible defeat happen again: coach Robin is fired and replaced by Vasile Sãraru. This has the desired effect: now it's the B's turn to wipe Demon Devils off the field, with no less than 0-5. With that the B's regain the first position in the league. A few days later another stud trainee joins the B's: Per Jansson, who also still plays for the B's, currently at brilliant PM with inadequate passing, defending ánd winger. Victim of these new trainees, among others, is Massimo Laterza, who unfortunately had to be sold although he will never be forgotten by the B's and may eventually return one day as an assistant. The B's finish the season winning all other games and thus winning the league title. They eventually finish 7 goals in front of number 2 Demon Devils, again scoring the most goals and conceding the least. Forward Ran Ben Avraham shares the top scorer title with 2 players from Demon Devils with 11 goals. The new season, in VII.873, contains one of the most boring periods in the history of the B's. In the middle of the season they have no less than 6 consecutive Walk Overs. Fortunately, the active managers are also active on the league conference, making up a lot for the boring game time. Also, the battle for the title is a tough one, since the three active teams in the league, V.V.O. United, America de Amsterdam and Blaakers, prove formidable opponents. But despite that, the B's again manage to win the league, with only one lost game. During the season two other important players are bought: trainee Allan Gisselmann and forward Boris Malicet, who besides excellent scoring and passable passing also has brilliant set pieces skill. Malicet would prove a formidable weapon later on in the history of the B's. Already this season he won the B's the match against Blaakers by scoring twice from set pieces. The first season in VI.540 marks the most difficult season for the B's up to this day. Although winning the first match 5-0, the B's find themselves at an 8th and last position halfway the season with only 4 points gathered. The B's board has already intervented by then and hired coach Priidu Joon, who apart from a solid coach skill also has passable leadership. This gives the B's the edge they need: they start winning games again, and one match day before the last they manage to avoid relegation with a wonderful 1-0 victory on the strong V.V. de Wiendhappers. The B's eventually finish 5th. In the second season in VI.540, The B's have had no relegation worries whatsoever, and secured the third place one match day before the last. In the KNVB Beker, the B's didn't do half bad either, reaching the 4th round. The third season in VI.540 brought success again. The B's managed to win the title, losing just one game (their last) and tieing two. The B's even autopromoted to division V, something that wasn't really planned but the B's had to deal with nonetheless. In the Cup, the fourth round was reached again. The B's now play in division V.45 and are currently 4th after winning two games and losing two others. The B's have bought a couple of new players: their first world class defender, Stanislav Kunitsyn, and their first two brilliant forwards, Diego Rubio and Šime Alvir. To accommodate that, some other players had to be sold, including two time topscorer Boris Malicet. So far, the new players have done the B's quite good. The hatstatsrecord has gone up from 180 last season to 239 now, and the starrecord now is 50 instead of 45 last season. Whether this will be enough to achieve this season's goal (not relegating) remains to be seen though. In the Cup, the B's managed to break their club record by reaching the 5th round, in which they were eliminated. The B's arena is called The Heavenly Hive. No need to explain that a Hive should be the home of the B's, but the fact it's a Heavenly Hive might be a tad strange for Killer B's. The reason for that is that the B's want to maintain a friendly image. With a name such as 'The Hell Hive' the atmosphere surrounding the club would have been one of negativity. Now, the positive stands out, also because the B's commonly refer to themselves as, well, the B's, and not The Killer B's. Initially The Heavenly Hive offered place for just 7000 spectators. The B's management soon realised that wouldn't be enough, so on July 18th, 2004 they expanded the Hive to 10000 seats. However, on the first match in the new stadium The Heavenly Hive was sold out already, so only 3 months later, on October 29th, 2004 the Hive was no less than doubled in size. Not long thereafter, all constructors announced prices to expand would double, so the B's quickly reacted to that and expanded to 5000 more seats on January 26th, 2005. Just one season later, the construction costs were to be doubled again, so the fans of the B's were in for quite a shock when they returned from there vacation on June 3rd, 2005: The Heavenly Hive was doubled again, to the current size of 50000 seats. On April 28th, 2006, The Heavenly Hive was the venue for the friendly U20 clash between U-20 Guatemala and U-20 Taiwan (3-3). This page was last edited on 17 November 2014, at 19:11.